I had seen this tutorial on Pinterest awhile back, so I gave it a try. I am pretty happy with the way they turned out! It took me less than an hour to make all four. 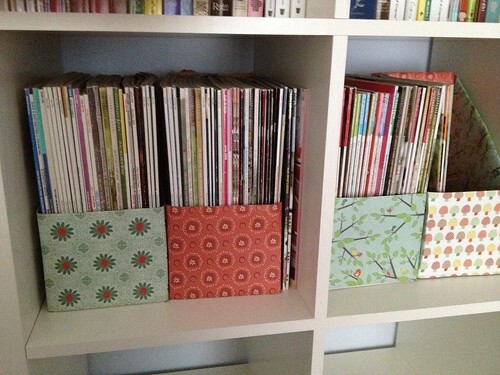 Not bad, and now my knitting and scrapbooking magazines are finally organized! I added some cute scrapbook paper to the front of them. I love the color combination. I just taped the scrapbook paper onto the front, so when I finally decide on the color scheme in the office, I can easily change the paper to match. Have you made anything cool off Pinterest lately?